Shrimp, shrimp…I love you so. Shrimp was my favorite food from the time I was old enough to pronounce the word. Living near the coast growing up (well, near the gulf anyway), I was knee-deep in shrimp. Most of our local restaurants had fried shrimp, fresh from the gulf. I remember the days when people commonly bought shrimp from panel vans parked at intersections hawking their wares with simple hand-printed signs. These days, we would call this one giant red flag (on wheels). I have been known to buy pounds of shrimp and prepare them several ways for the same meal. Spicy boiled shrimp, fried shrimp, shrimp scampi, grilled Cajun shrimp… just call me Bubba Gump. For the seasoning blend, you can use all powdered/granulated, or toss it in a mortar and pestle and grind it down if you have the whole versions. First, make your seasoning blend and set it aside in a small bowl. Next, take your clean shrimp and place them on paper towels and gently pat dry. Heat a LARGE skillet on the stove with 2 tbsp. olive oil, over med-hi heat. (The large skillet gives you more room to work with when mixing your pasta later.) Boil water for your pasta. 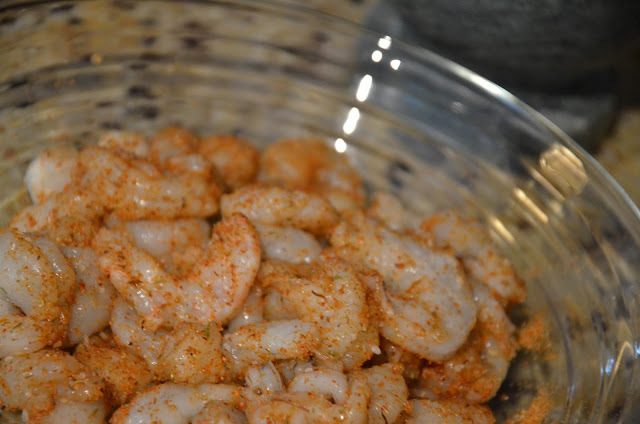 Remove the paper towels from the shrimp and sprinkle with the seasoning blend, tossing to coat evenly. 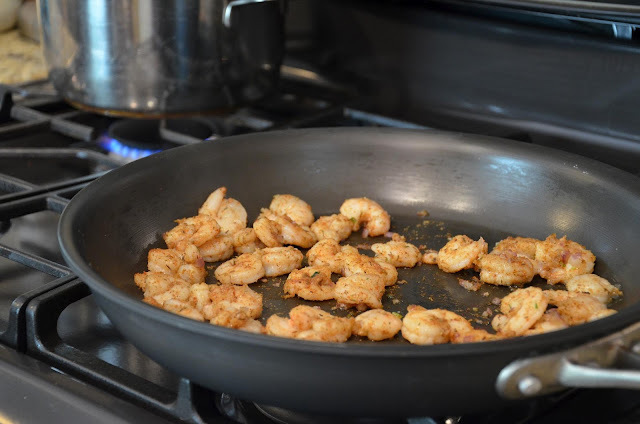 Once the skillet is ready, add the shrimp, distributing them evenly with a spatula. When the shrimp begin to turn pink, turn them and sauté, gently pushing them around in the skillet for another minute or so. Add a bit of olive oil and a couple of pinches of salt to your boiling water, and cook your Angel hair pasta according to instructions, al dente. When you bite into it and there is still the slightest resistance at the core of the pasta, it is perfect. Feel free to take a bite here and there to see if your pasta is ready – it’s so much better when not overcooked! Drain and set aside. Reheat the skillet to med-hi heat. Add 2 tbsp. olive oil and the finely diced onions; sauté until translucent. Add the mushrooms and sauté for another minute. Add the heavy cream to the skillet, and simmer until it begins to thicken, scraping the bottom with a spatula. 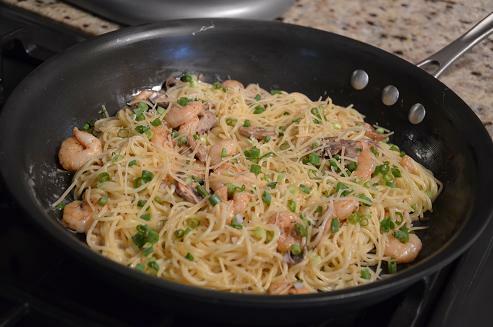 Add the pasta and shrimp. Using tongs, toss and mix until well-blended and thickened. Remove from heat. 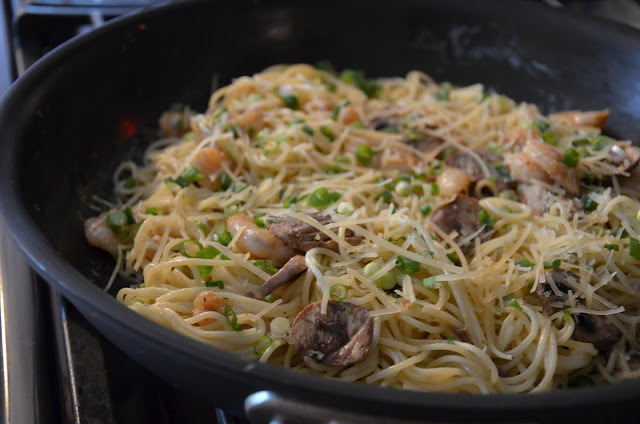 Top with green onions and Parmesan, and serve!